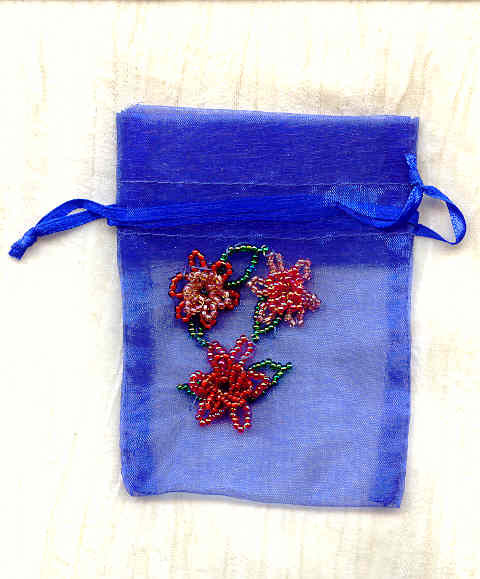 Make it just that much MORE impressive by giving it in one of our charming beaded gift bags. This one is sheer iridescent royal blue with emerald leaves, and flowers worked in shades of coral and carnelian. The bag is about 4" long by 3" wide (measured flat), and closes with a satin ribbon draw string. When big things need to come in small packages, let the gift-wrapping come from SPARKLE PLENTY. Two sizes of dyed violet carved hammershell flowers are suspended from sterling silver leverback findings. The bangle itself is made of lightweight sky blue acrylic.